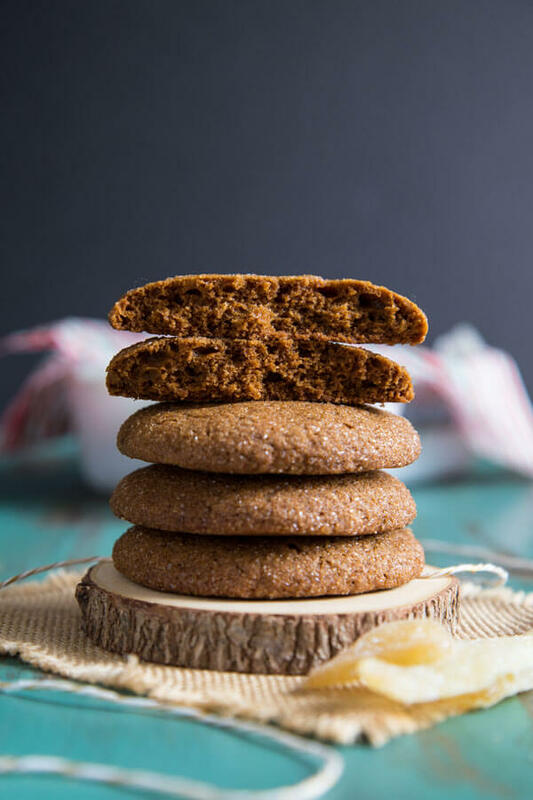 These Ginger Molasses Cookies are made with sweet and spicy ground ginger along with a mixture of warm holiday spices. There are also surprised pieces of candied ginger mixed into the dough. They are soft and spicy, and irresistibly delicious. I love giving out cookies during the holiday as edible gifts. To me, homemade gifts are the best gifts of all because of the time and love you put into making them extra special. 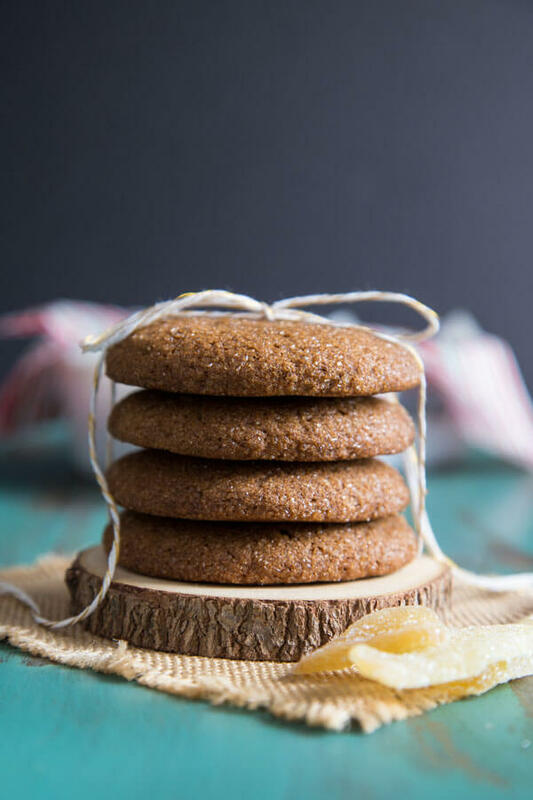 Since I won’t be able to hand deliver cookies to all the lovely friends I’ve made this year through this wonderful blogging community, I made these Ginger Molasses Cookies as part of our virtual Christmas cookie swap. 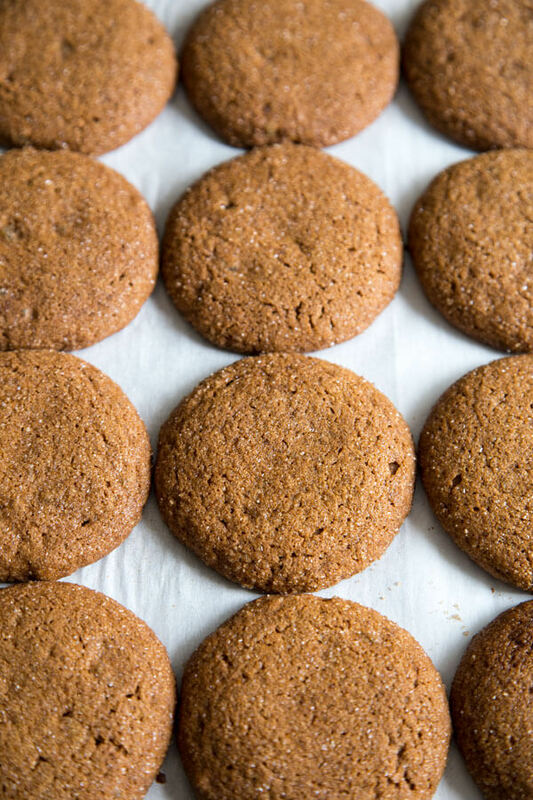 Ginger Molasses Cookies are so quintessential holiday. 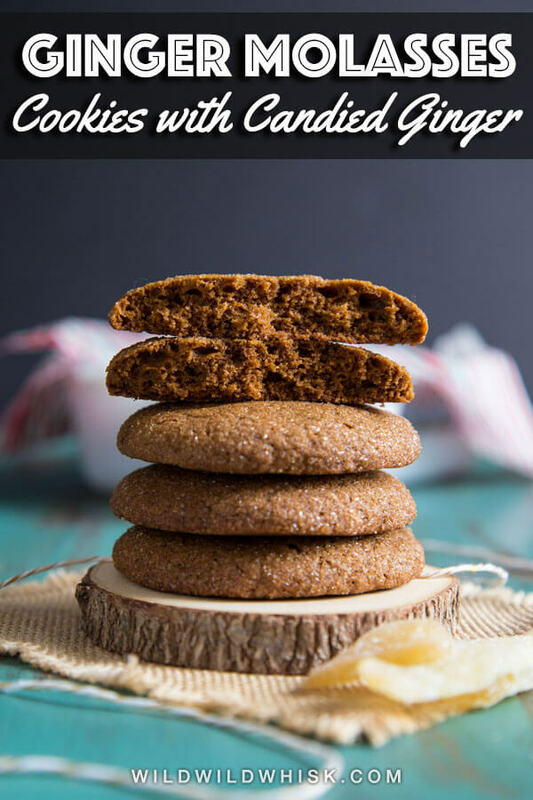 It’s really hard to pick my favorite holiday cookies but these special soft molasses cookies are definitely at the top of the list. 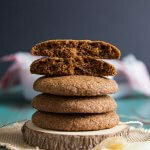 They are spiced with lots of sweet ground ginger, along with cinnamon, a hint of allspice, nutmeg and cloves. There are also diced candied ginger mixed into the cookie for an extra dose of gingery goodness. 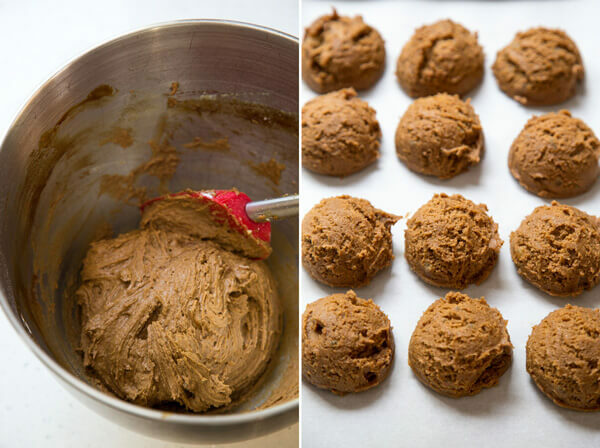 This cookie dough is extremely simple to make. Start by creaming soften butter with brown sugar. 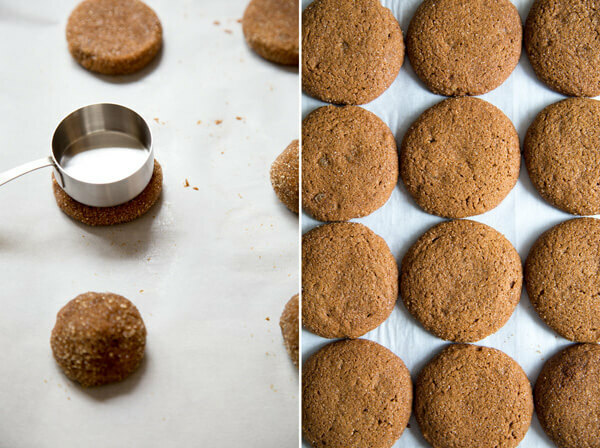 I use light brown sugar in this recipe since it’s a stable in my pantry, but either light and dark brown sugar will work. Then add the molasses, followed by egg and vanilla extract. Stir in the flour mixture until just combined, then add in the diced candied ginger. Always give it a last quick stir with a spatula to scrape down the side and bottom of the bowl and ensure everything is well mixed without overmixing the dough. This dough is soft but should be pretty easy to handle. I always use a Large Ice Cream/Cookie Scoop to portion the dough. This batch will yield about 13 portions. 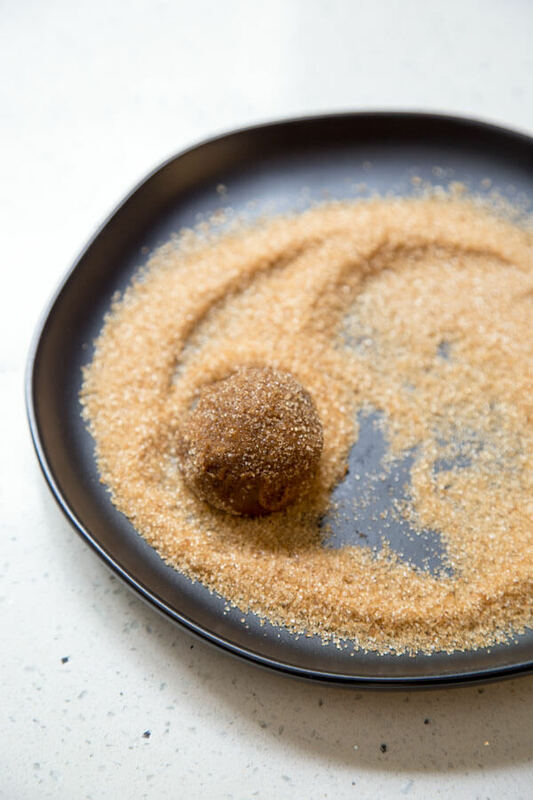 Roll each portion into a ball, then roll the balls in raw sugar. If the dough seems sticky, you can pop them in the fridge to chill for 10-15 minutes just so they are easier to handle. Flattening the dough balls before baking will help them spread evenly and yield perfectly shaped cookies. The theme for our Christmas cookie swap, or I should say Christmas treat swap, this year is Gingerbread. 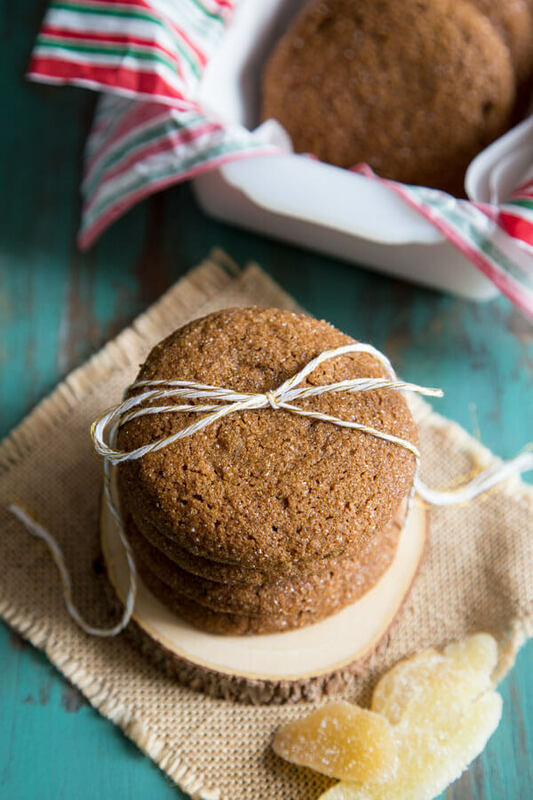 So anything gingerbread related is a go, and I think you will love them all. We have so many different treats including biscotti, cake, trifle and doughnuts. We got you covered for desserts, snacks and brunches, which are all the meals we care about this season, right? Dice the candied ginger (or crystallized ginger) into small pieces, measure out 1/4 cup and set aside. Preheat oven to 350°F. Line 2 or 3 baking sheets with parchment paper. Cream soften butter and sugar in a mixing bowl with the paddle attachment until light and fluffy. Add molasses and beat to combine. Add egg and vanilla extract and beat until combined. Add flour, spices, salt, baking powder and baking soda to a small bowl and mix with a whisk to distribute evenly. 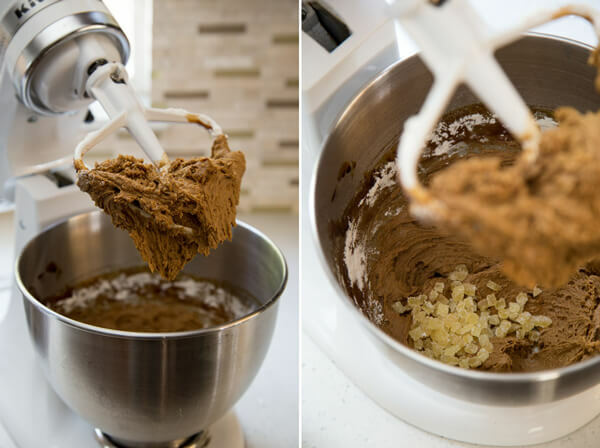 With the mixer on the lowest speed, slowly add the flour mixture to the stand mixer bowl and mix until just combined. Stir in the chopped candied ginger set aside earlier. Use a spatula to scrape the side and bottom of the bowl to ensure everything is incorporated. Spread raw sugar on a shallow dish or plate. Use a large cookie scoops to divide the dough into 13 portions, about 1.5 oz each. Roll each portion of dough into balls, then roll the balls in raw sugar. Place them on the prepared baking sheets about 2 inches apart. Just before baking, use the bottom of a measuring cup to flatten the dough balls. Bake one baking sheet at a time for 12 minutes. Remove from the oven, let cookies cool on the baking sheet for 5 - 10 minutes before transferring to a wire rack to cool completely. This dough is soft but should be easy to handle. However, if you find it sticky, you can chill it in the fridge for 15 minutes or so before rolling it into ball. Chill it after you have portioned it out with a cookie scoop. Absolutely perfect for the Holidays!!! Can’t wait to try them! Yum! How long do you think these will stay good at room temp in an airtight container? Three days and probably okay up to five, but they do go stale the longer you keep them. Great recipe! 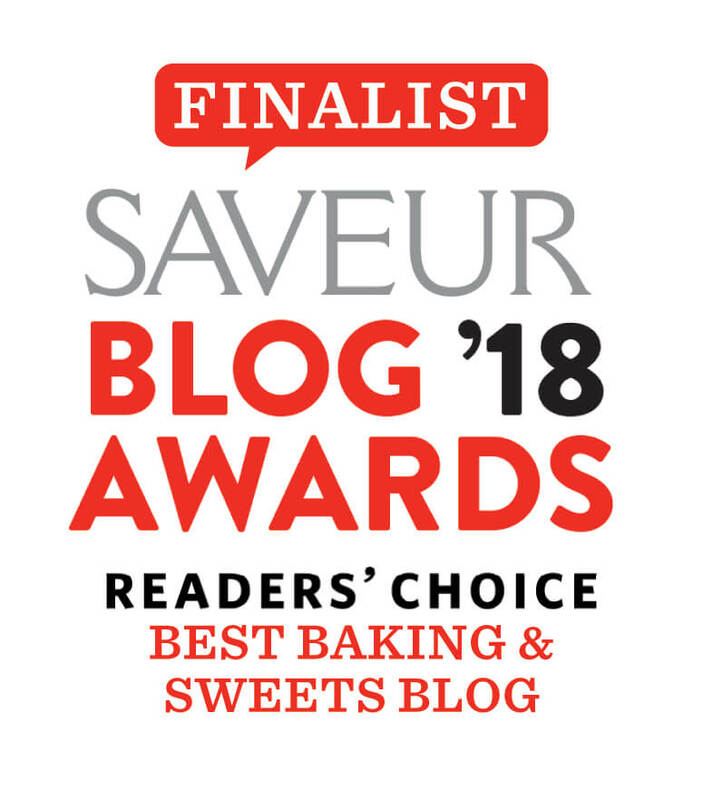 I love the idea of the candied ginger here!! These look just like my grandma used to make! I could eat 6 of these in one sitting 😉 . Take care.